"The Scots infantry that attempted to emulate the Swiss in 1513 were sketchily trained, had little real experience of battle and could not have the same confidence in their drills and tactics as the Swiss. This meant that the Scots adopted the same solution which the French and landsknechts had used of placing their captains, or noblemen in the front ranks. In fact, Scottish noblemen had considered the front ranks as their proper place in a formation since at least the battle of Bannockburn. Scottish armies were led from the front to give encouragement and steadiness to the more hesitant feudal levies." "Typical at the front ranks of the Scottish pike columns. This figure wears a doublet and hose, and over them an imported almain rivet armour with arm defences. His helmet is a sallet of Italian manufacture, with a bellows-faced vizor [sic] and an articulated neck guard." "Those below the front rank of Scottish society might wear imported armours known as almain rivet. 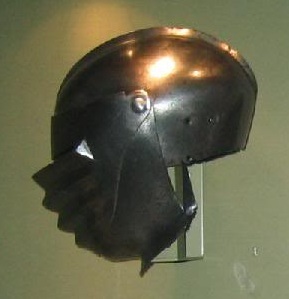 These were essentially munition-quality harness comprising breast and back, a sallet-type helmet, possibly Italian and tending to feature a rounded or 'bellows face' visor. Articulated tassets covered the thighs, though the lower legs were normally unprotected, save for stout leather boots." "A sword related to the claymore is known as the 'Lowland' form because of the fact that several examples came from southern Scotland. Lowland swords had angular, round-section quillons, the terminals arranged as turned knobs set at right angles; some have open rings affixed to the center of the quillons on each side. They retain the feature of the quillon block extending to a spur on each side but, unlike the claymore's, this spur was small and pointed. The pommels of these swords were large and spherical, the long tubular-section grips being of wood covered with leather." "The Lowland equivalent [to the Highland claymore] was distinguishable by straight quillons, but was otherwise the same. It is reasonable to believe that the men armed with these weapons could fulfil a role similar to the Landsknecht 'doppelsöldners', who preceded their own pikemen with the aim of disrupting enemy formations by cleaving off pikeheads and exploiting gaps in the formation; however, there is no evidence for the deliberate employment of such tactics by the Scots on the battlefield." "[The 'lowland sword'] had a very long blade with a characteristic side ring to the hilt, globular pommel and quillons set at right angles to the blade, terminating in knobs. These great lowland swords were used for many years, and even as late as 1746, after the Battle of Culloden, many examples were subsequently found on the battlefield."